Amritsari Fish Fry Recipe is a crisp, golden, deep fried fish preparation from Punjab. 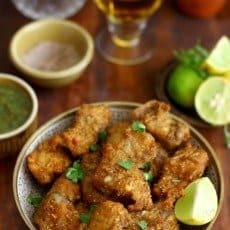 The land of Dal Makhani and Tandoori Chicken has a fondness for fried fish as well, Amritsari Fish Fry is the not so secret Punjabi style deep fried fish recipe. Fish Fry is our everyday comfort food when the spine-chilling winter breeze quietly creeps into the house as the sun set down. The family gathers around the fireplace and desperately crave for fried bites to accompany the bottle of good old rum or brandy. The crunchy uppermost layer of the fried fish is the envelope for the mouth-melting texture inside. 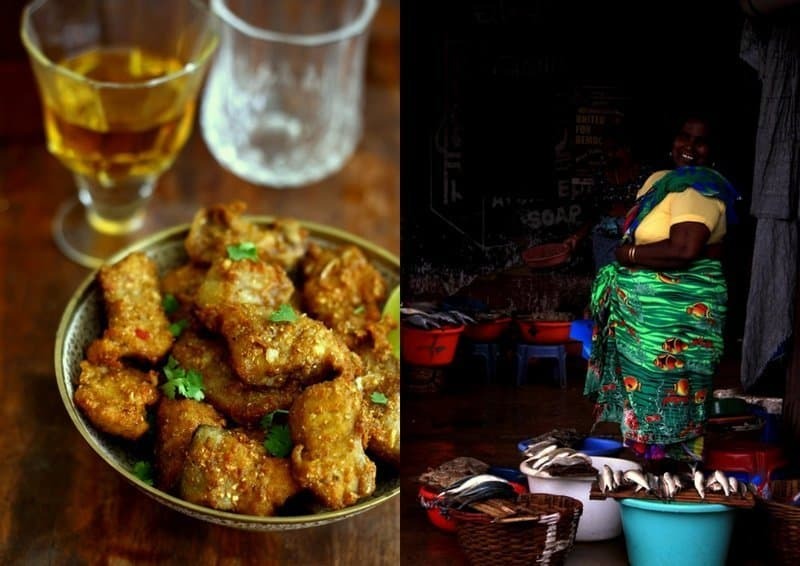 Few basic ingredients and spices smeared over the fresh catch of the day, deep-fried, accompanied by a bottle of the favorite alcohol and the evening dinner table is all set to host the hungry goblins. The late evening walks to the farmer’s market twice in a week to pick our fish catch, arguing with the fishmonger to settle the best deal, hand-picking those perfect fillets and later slicing each into bite-size pieces is an enriching experience. Such simple transports of delight can be experienced in a slow-paced countryside lifestyle only. Coming back to the fish, surmai (king mackerel) or any other oily, tender fish is a good choice for Amritsari Fish Fry. With a sprinkle of Chaat Masala and a drizzle of lemon juice, Amritsari Fish Fry is all decked up to be gobbled. 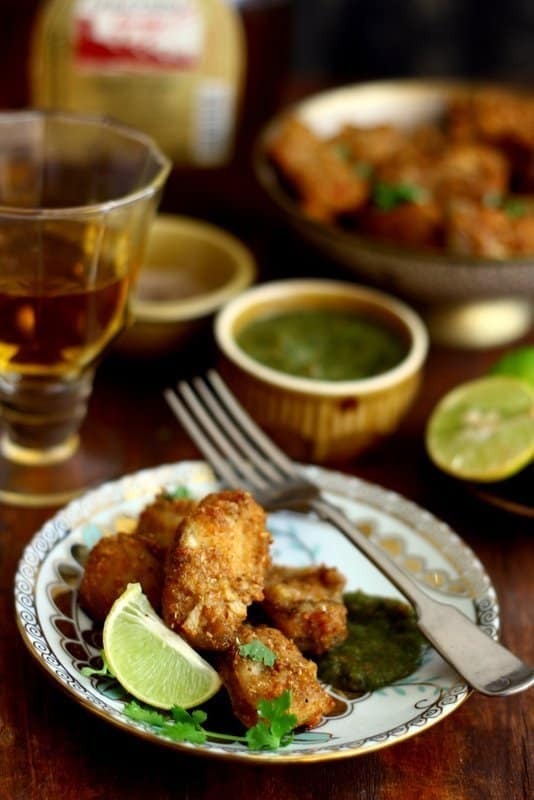 A refreshing mint, coriander chutney on the side to dip in the hot fried fish is an additional perk on the dining table. Though I feel the fried fish in itself is bursting with delicate flavors and hardly needs any accompaniments on the side. Amritsari Fish Fry is a delicious deep fried fish preparation from Punjab. 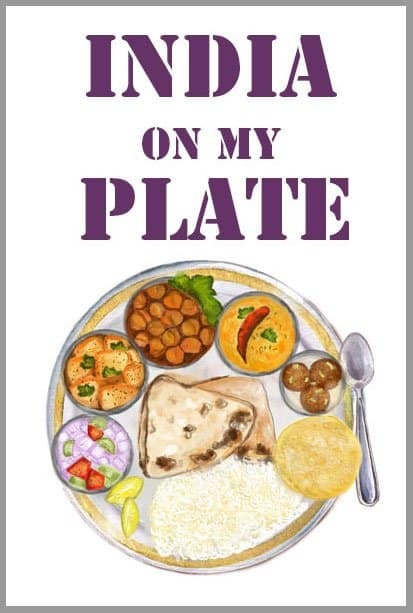 Learn how to make Punjabi style fish fry in few simple steps. To make the Amritsari Fish Fry, first clean, rinse and pat dry the fish pieces. Sprinkle wheat flour over the fish pieces and gently mix to coat pieces with flour. Let the fish pieces sit coated with flour for 5 - 10 minutes. Then rinse again and pat dry with a napkin. This step helps removing strong fish odor. This step if totally optional. In mortar and pestle make paste of carom seeds, coriander seeds and garlic. Add gram flour, salt, spice paste, lemon juice, turmeric and chili powder over the fish pieces. Stir to combine so that each fish piece is evenly coated with the spice mixture. Set aside for 10 - 15 minutes. Meanwhile, heat sufficient oil in a deep fry pan over medium heat to fry the fish pieces. Deep fry fish pieces in hot oil till crisp and golden from all sides. Drain fried fish pieces and place on an oil absorbent paper. Alternatively, you can grill the fish pieces as well in the oven, air fryer or grill pan. 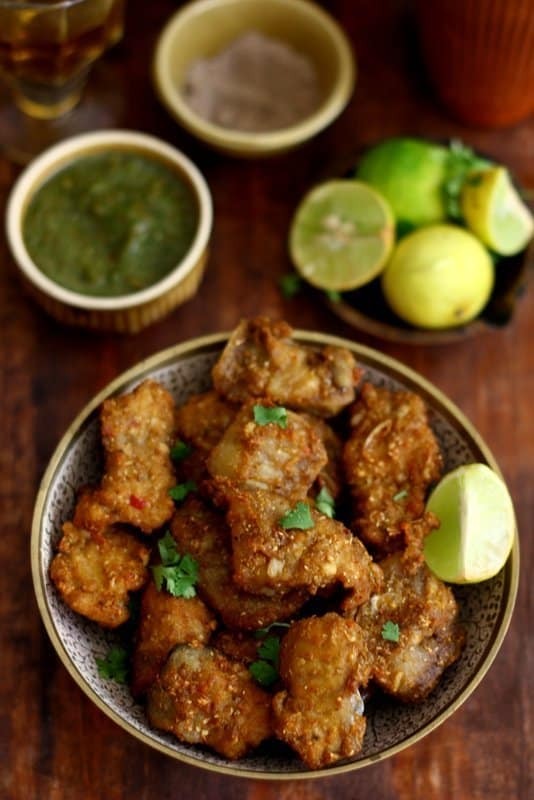 Serve Amritsari Fish Fry warm, sprinkled with chaat masala, lemon juice and chutney.